You may recall that my last grain elevator trip was rather small, covering only three new grain elevators over one morning. This one... much bigger. I had never been in southwest Manitoba, and as part of my Manitoba grain elevator project I wanted to go to the "bottom left" of MB to photograph the elevators there. If you look at my Manitoba grain elevator map, you can see there are a lot of elevators there. I had planned on going on the August 1-3 weekend but the weather was terrible... so the following weekend was the target. 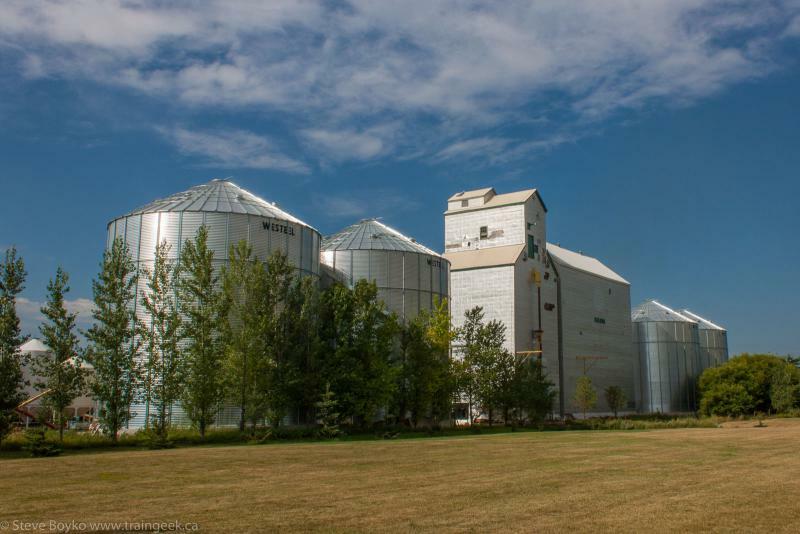 Yeah, that's right, 48 new-to-me grain elevators at 34 locations. I resolved to take August 8 as a vacation day and hit the road at a reasonable time of 9 AM. As it happened, I was ready to roll by 7:30 so off I went, already ahead of schedule. 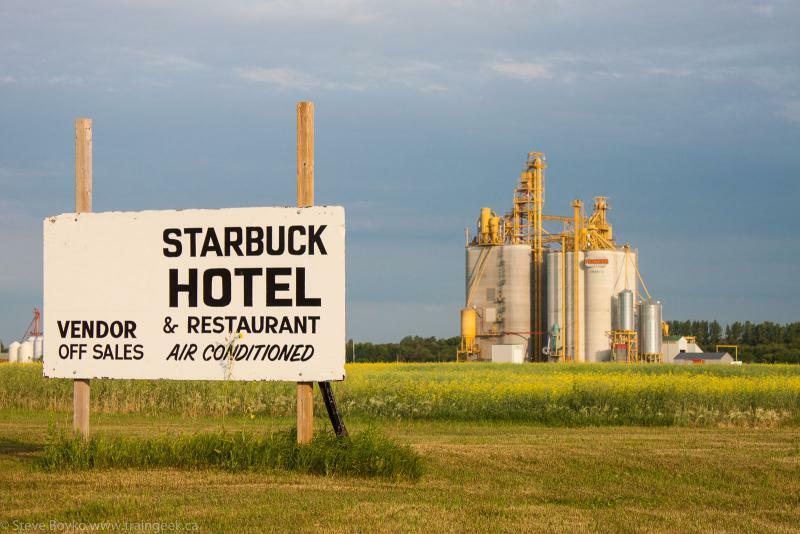 I drove down highway 2 past Starbuck and Fannystelle. As I approached Culross I saw some really interesting clouds, so I had to stop and photograph them. While passing Elm Creek, the skies opened up and it really poured for a few minutes. I thought, "oh, what a great start to this trip," but within a few minutes I popped out the other side of the storm and it was blue skies from there onward. Nice. 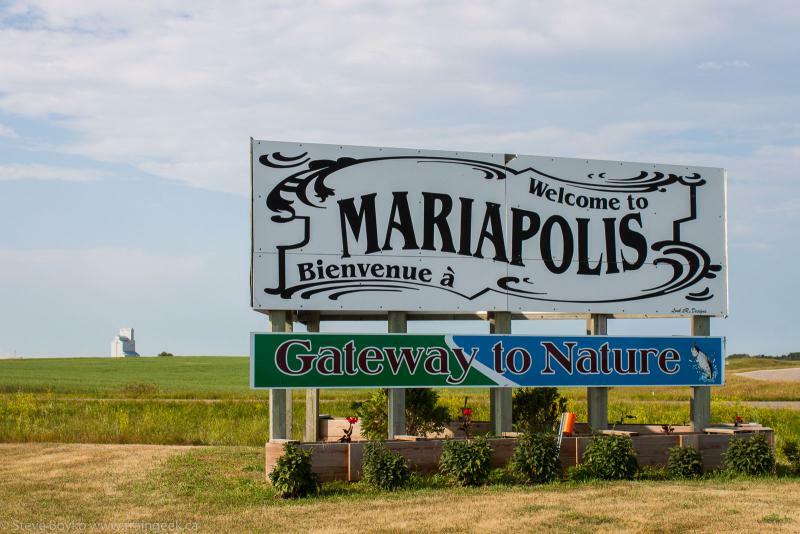 My first target was Baldur, and I had to pass Mariapolis on the way. Soon after Mariapolis, I arrived in Baldur. The single elevator has an annex and some bins. It appears to be in use, probably by a local farmer or cooperative. It has a nice main street, well kept and apparently prosperous. Baldur Trading was quite a nice store. Off to Cartwright. 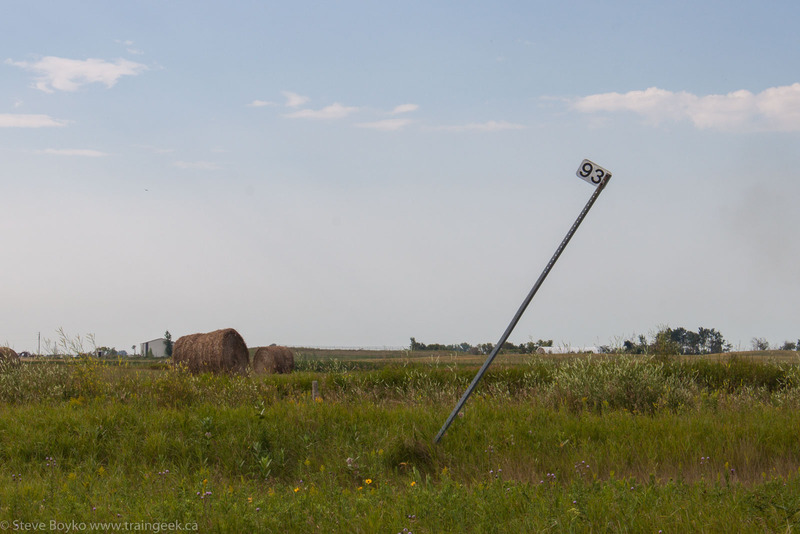 As I drove west along highway 23 I spied a few mile markers left from when the Southern Manitoba Railway had track through Baldur. 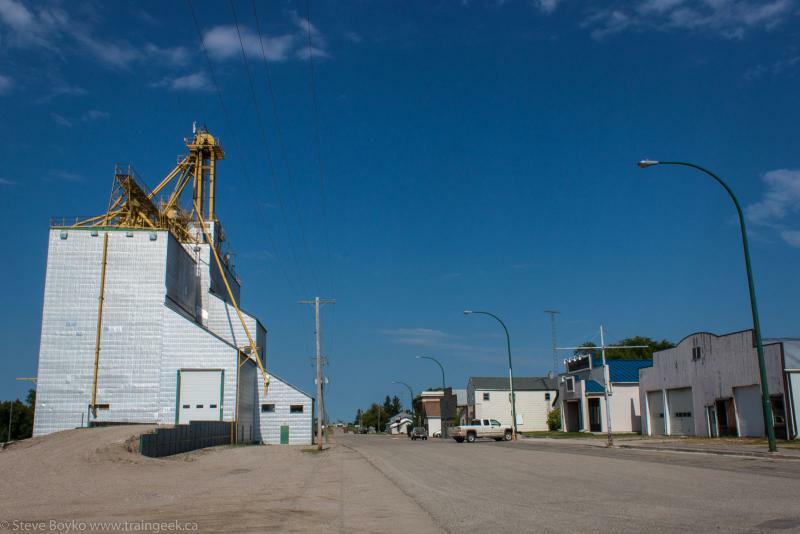 The Cartwright grain elevator is located right downtown, as is typical for grain elevators. It used to be on the CP Napinka subdivision. This elevator appeared to be well-maintained as well. The next one elevator on my list... it was pretty special. 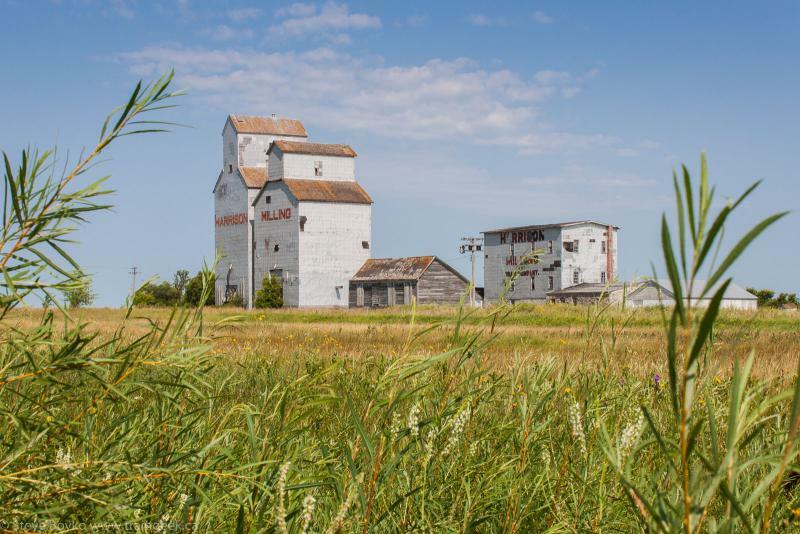 As you can see, there are two grain elevators joined together. 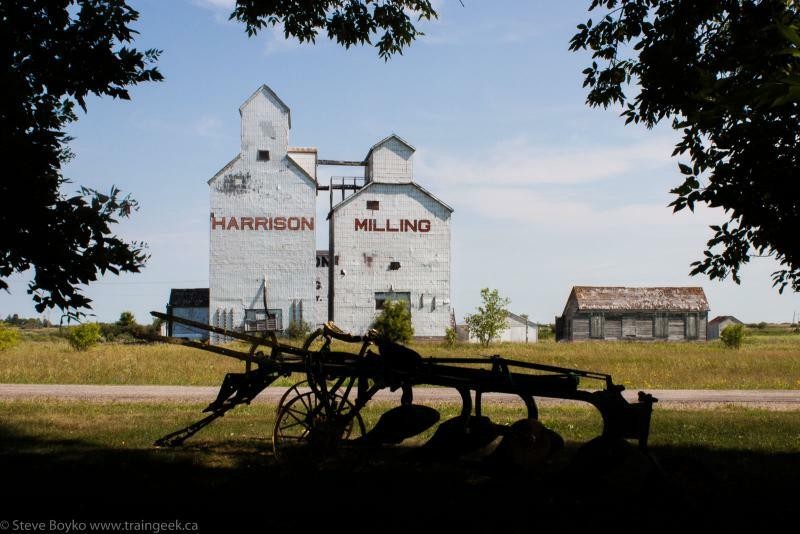 The left one labeled "HARRISON" was built in 1926 by Harrison Milling to replace their original elevator built in 1892. 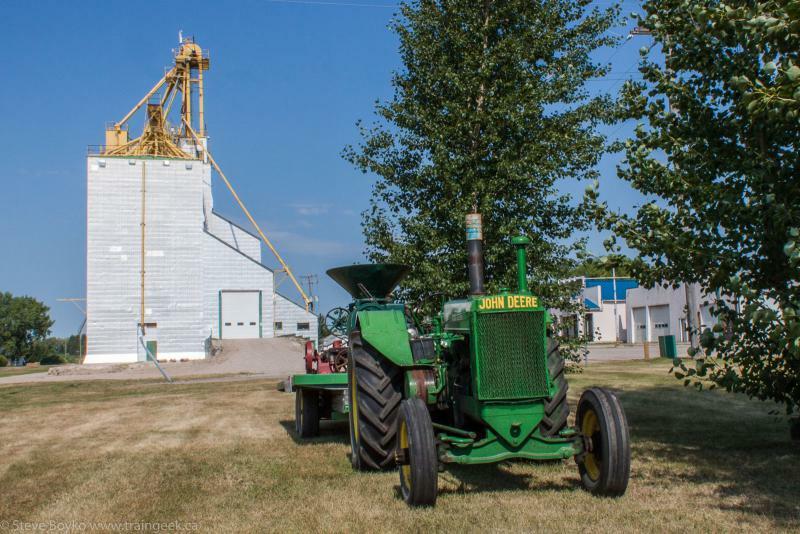 The right elevator was a Federal grain elevator that was originally located several hundred feet away, but was moved to its present location several decades ago. I photographed the elevators from the main street in the town. There's a general store in town, now closed, but full of interesting items. There's a sign on the door dated from 2013 directing where to go to gain access to the store. Clearly it hasn't been open for a while. It had a car in front so the building may be active in some capacity. Holmfield was at mile 42.8 of the CP Napinka subdivision, just over 7 miles from Cartwright to the east and just under 9 miles to Killarney to the west. The current end of the Napinka sub is mile 49.0. 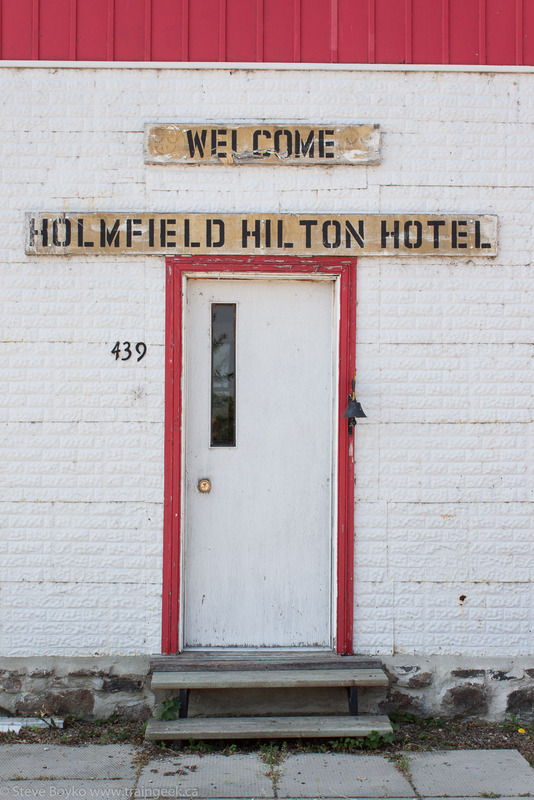 Oddly, Holmfield was also served by CN for a period of time! The CN Wakopa subdivision came through Holmfield but was pulled up in 1961. 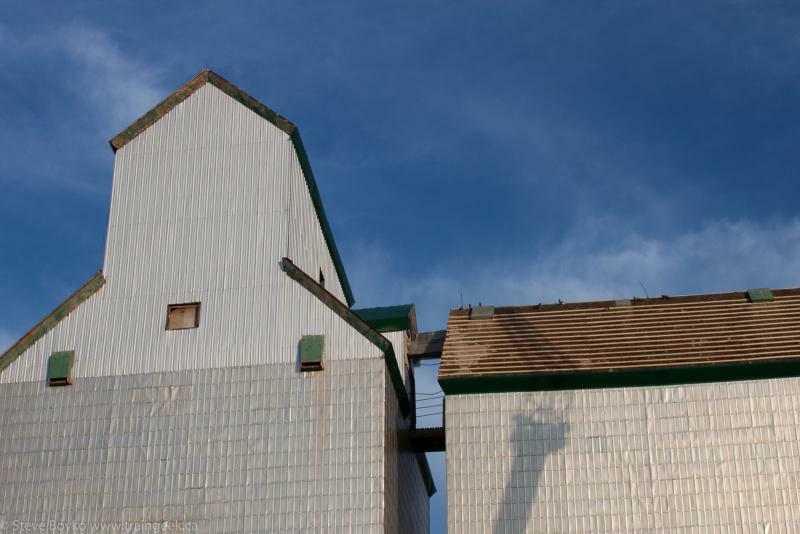 Anyway, back to the grain elevators and the mill. I noticed a car in front of the mill, so I walked up to the building and knocked. It turns out that one of the Harrison brothers was inside doing some maintenance. I talked with him for a few minutes and he supplied the details on the elevators I shared above. 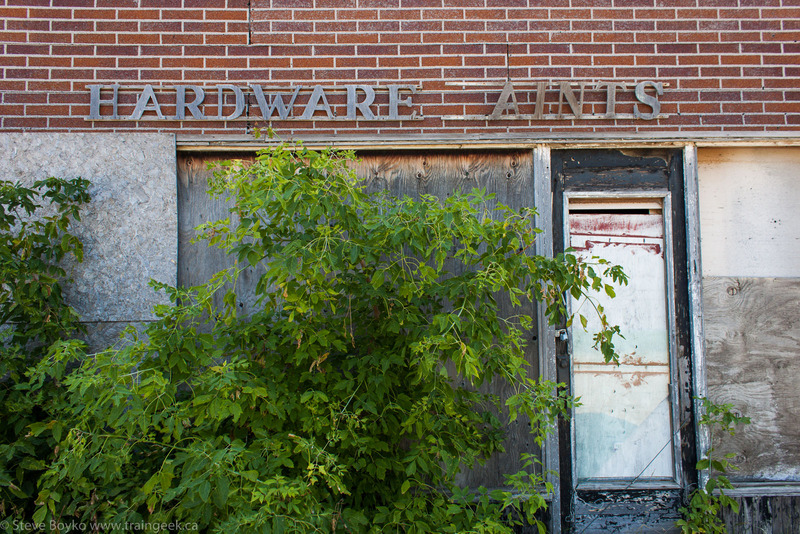 On my way out I had to photograph one more derelict building. Time was a-wasting, so I had to move on. Next on the list was Lena. The elevator is clearly in use by a local farmer. 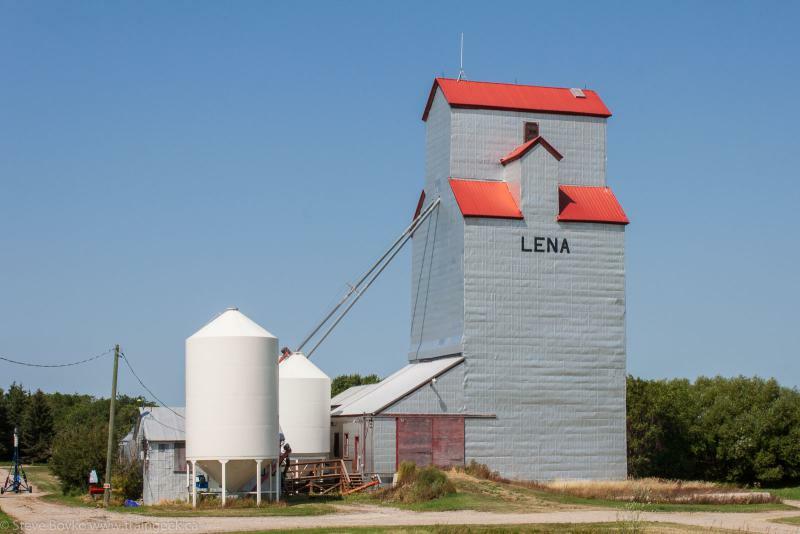 Lena was on the CN Wakopa subdivision and lost rail service in 1961. I wonder what the asking price for this building is? Someone in Lena is collecting steam tractors! 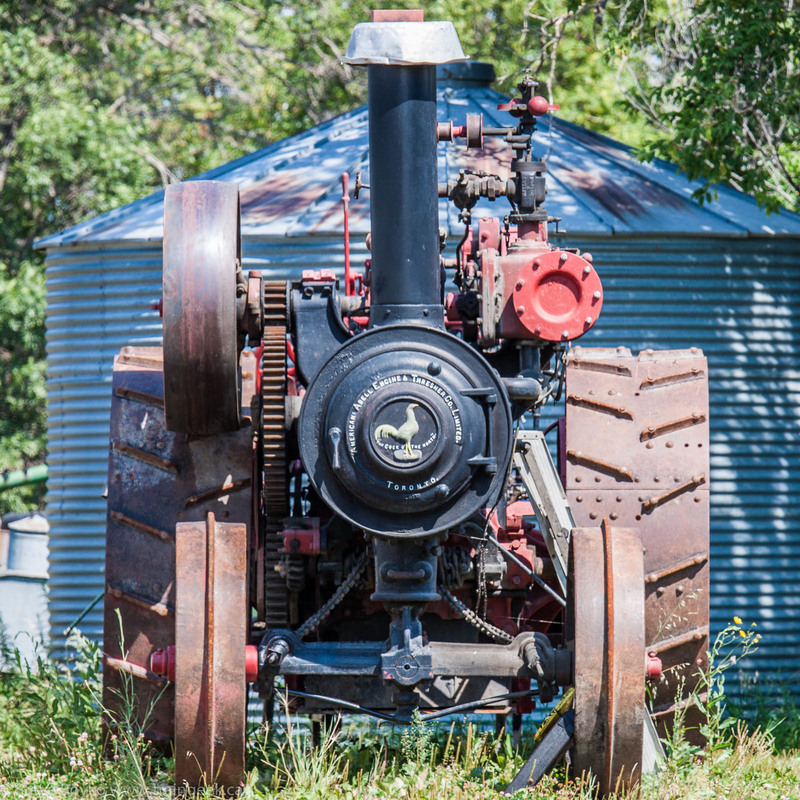 I wrote about this tractor on Google+ - it was built sometime between 1902 and 1912 by the American-Abell Engine and Thresher Company of Toronto. Next up was Killarney... for the next post. 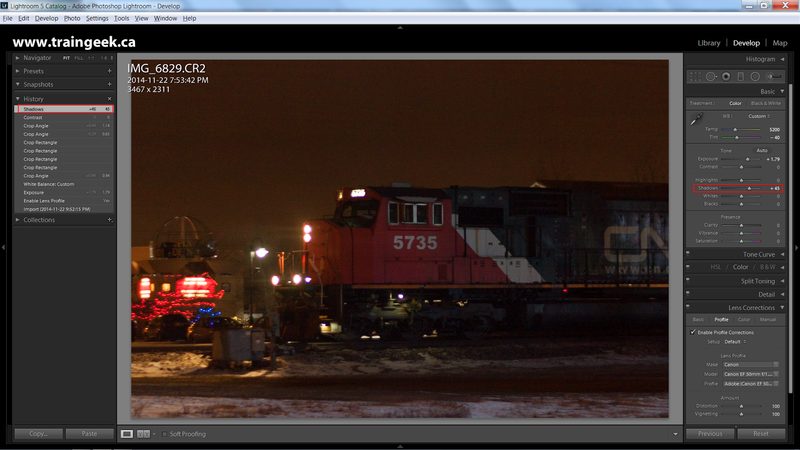 I mentioned that CN was running a Christmas train in Winnipeg this year. Well, here it is. This train was organized by local CN people and will visit Winnipeg, Saskatoon and Edmonton to carry CN employees and their families. Funds raised will benefit local charities. The Winnipeg runs raised $11,000 for the Christmas Cheer Board! Mark Perry posted some photos in the RailsMBSK Facebook group. You have to be a Facebook member to see them. The train had E9 CN 103 providing head-end power, four rented VIA coaches, and CN 8925 did the heavy lifting. I almost missed this train. It was scheduled to run from Symington Yard in Winnipeg out to Diamond on the CN Rivers subdivision and back, twice a night. I went up to Carman Junction to wait for the train. 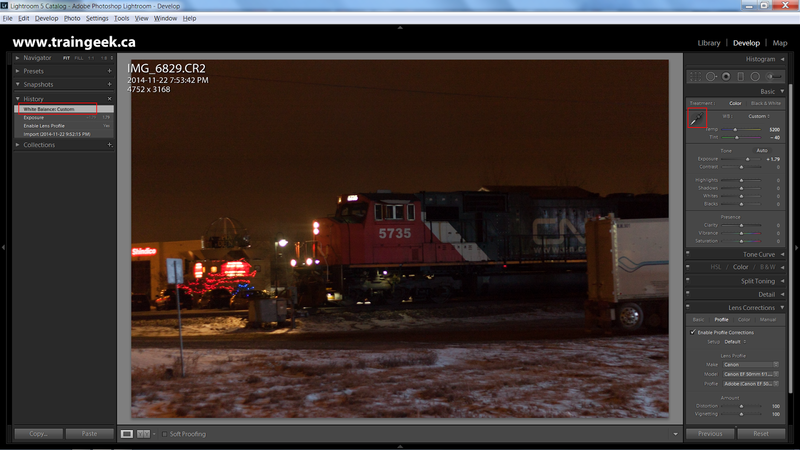 Fortunately I had my scanner with me and I heard CN 8925 mention they were at Waverley - a few miles east of my location. I hotfooted it (OK, drove) over to Waverley Street and I found them just west of the road, waiting for CN 315 to pass. They had to wait for 315 because it was crossing over from the south to the north track in front of them. 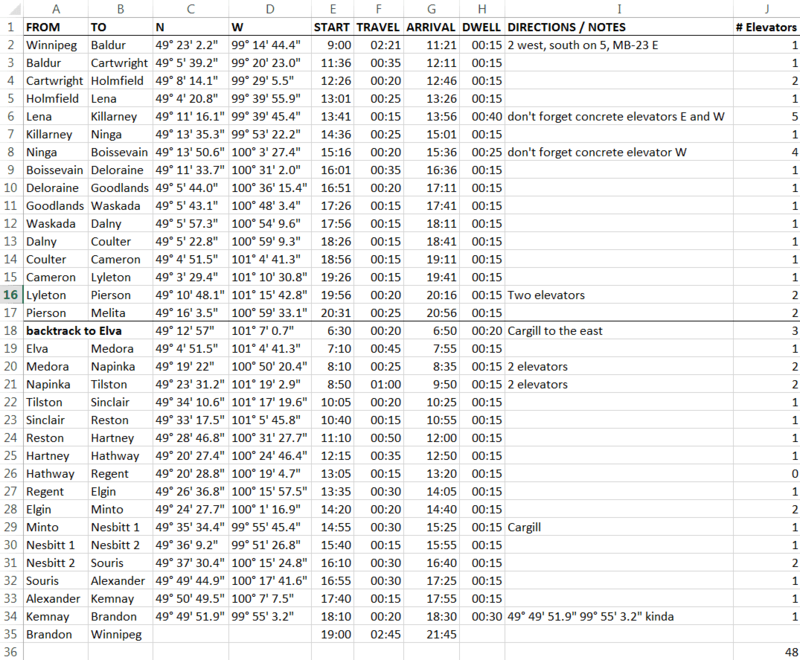 Once 315 went by, they headed west back to Symington and that's where I filmed them. 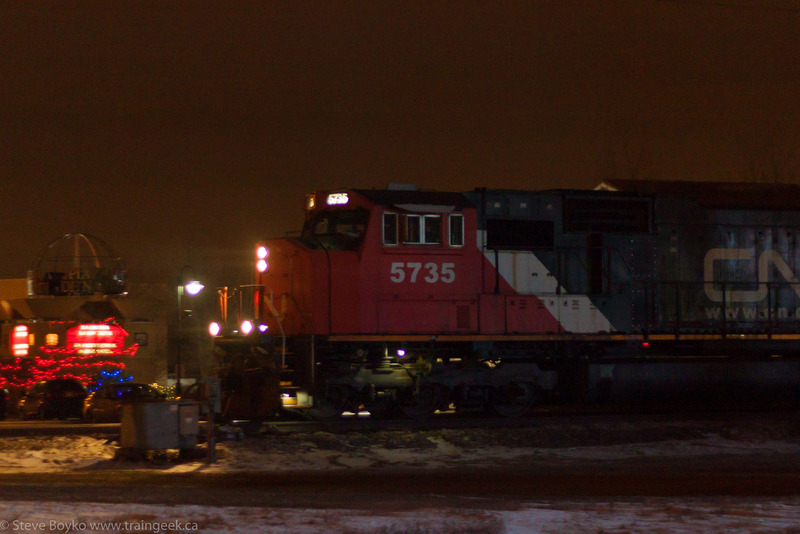 CN 5735 was the lead engine of 315 and that was the night photo I was processing earlier. Taylor Woolston also caught the train, a day later than I did. 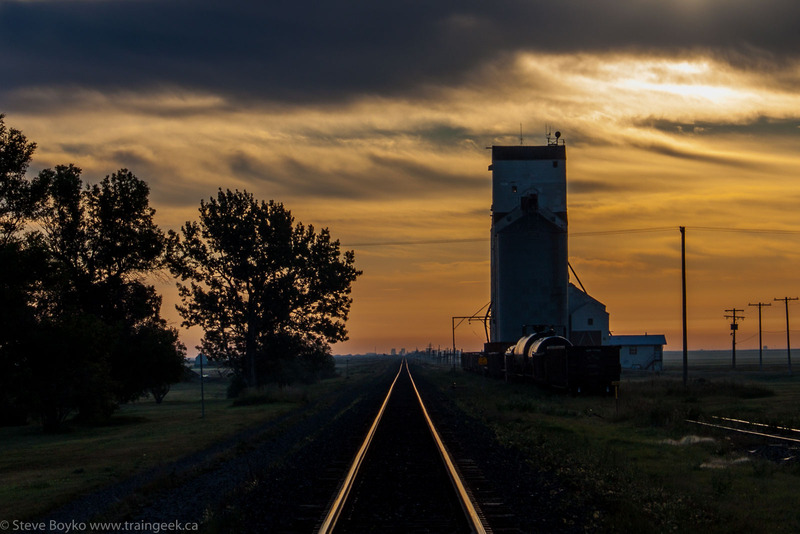 PS time is running out to buy a train calendar or grain elevator calendar in time for Christmas! In this post I am going to step you through how I edited a photo I took last night to arrive at the photo above. As I mentioned before, I use Adobe Lightroom 5 (affiliate link). By no means is this the only way to edit a night photo, nor is this the "right" order to process images. Try your own way! OK, here we go. Note that I locked the ISO to 400. If I had left it at AUTO my camera would have used ISO 1600 and the noise would have been terrible. I always override the ISO at night or low light, and with my T1i I find the noise is too much at ISO 800+ so I keep it at 400. I chose 1/80s for the shutter speed to strike a balance between sharpness and light. I probably could have gone down to 1/30s as I do have steady hands. 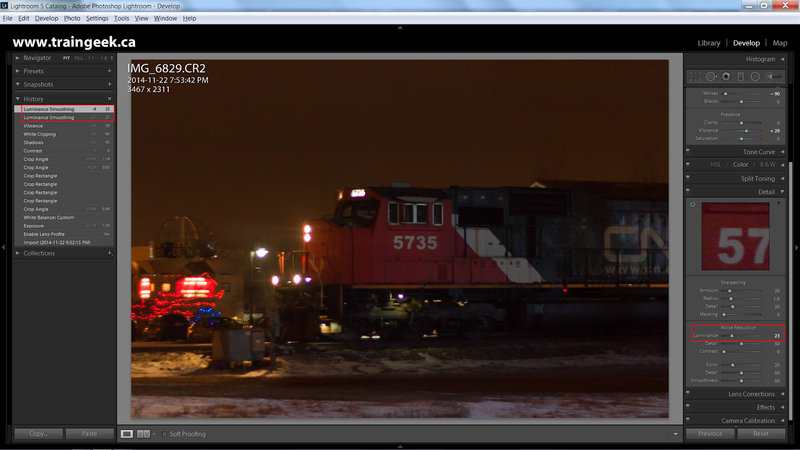 Here's how it looked in Lightroom when I first imported the RAW file. I always shoot in RAW format rather than JPG format as there is a lot more detail in a RAW file, which is especially important in night photography. Here's a couple of things to note about the interface. On the left there is a section called "History" where Lightroom documents every change you make to the image. 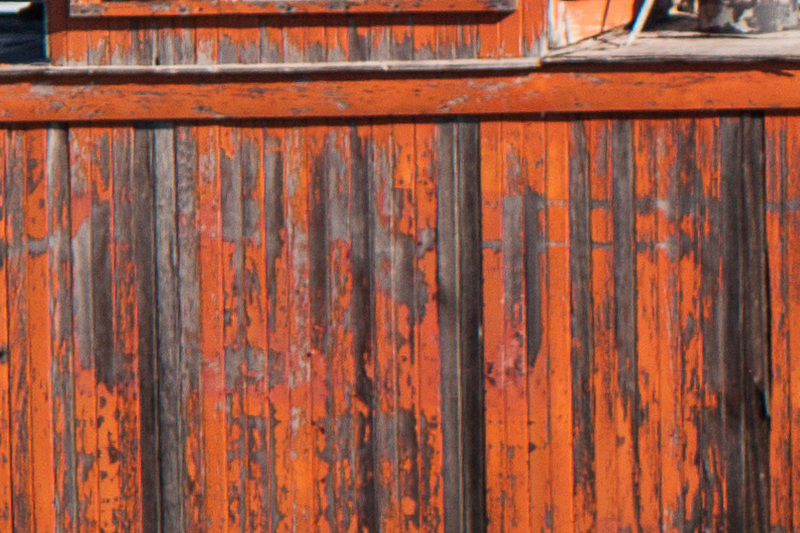 This is one great benefit of Lightroom - changes are non-destructive and you can always go back. On the right are the various sliders and controls used to edit the image. So far all I've done is import it. First, we apply the lens profile. It didn't do much - you'll see the corners are a bit brighter and it corrected for lens distortion a bit. 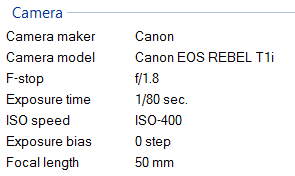 I was using my Canon 50mm f/1.8 lens as that is the most light-sensitive lens I have. The f/1.8 indicates the aperture will open up as much as 50/1.8=27.78 mm. If it was, say, f/4 then the lens would open up only to 12.5 mm in diameter, which means a lot less light would come in to the sensor. Low f numbers are better for low light and night photography. I always apply the lens profile and you should too. You'll really see a difference when using a wide angle lens, especially a cheap kit lens like my 18-55mm lens, because there is a lot of distortion when shooting at 18mm. The horizon lines are not straight until you apply the profile! Anyway, the next step is to adjust the exposure. I brought it up quite a bit to get it reasonably bright. You can't keep cranking the exposure because the noise of the photo really starts to show. Click on any image to view them larger to really see the noise. You might notice that the colours are a little "off". A very important step is to apply the right white balance. Here I clicked on that eye-dropper highlighted at right and clicked on the white stripe on the engine just to the right of the number. You're telling Lightroom "this is white" and then Lightroom will adjust the rest of the image. At night your camera has a really hard time determining what "white" is so the white balance is often wrong. You'll see this with winter scenes too because the expanse of snow fools the sensor and you end up with very dull, gray photos until you adjust the white balance. This is not something new with digital cameras - your camera processor (or you in the darkroom) would adjust the development based on the ambient lighting. Now it's time to crop and straighten. Here I am in the middle of leveling the image. In the next screen capture, you'll see I cropped out the truck and post and fiddled with it for a while to get it level. Next I worked on the shadows. This was a subtle edit. You'll see a bit more detail in the trucks and underside of the locomotive. Next I adjusted the vibrance. In Lightroom you have two options to change the intensity of colour in the photo, vibrance and saturation. I almost always use vibrance. The difference is that saturation adjusts all of the colours while vibrance tries to preserve skin tones. I find that boosting the vibrance makes a photo more vivid without looking unrealistic. Now we have to deal with the noise. Here I opened the Detail pane and you can see how much grain / noise is present in the image. 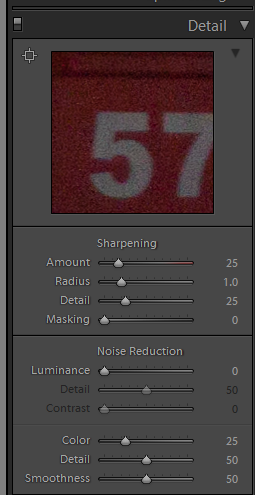 The luminance slider is what I use for noise reduction. I fiddled with a couple of settings, as you'll see. That's the finished image. You can crank the noise reduction higher but what you'll find is that it looks too plastic and you lose a lot of detail. If you ever see selfies where the person looks very plastic, that's too much "skin smoothing" which is basically the same thing, averaging pixels to try to remove dots and imperfections. I hope you enjoyed this little romp through my photo editing workflow! I'm a member of a number of Facebook rail-related groups and I wanted to share those with you. 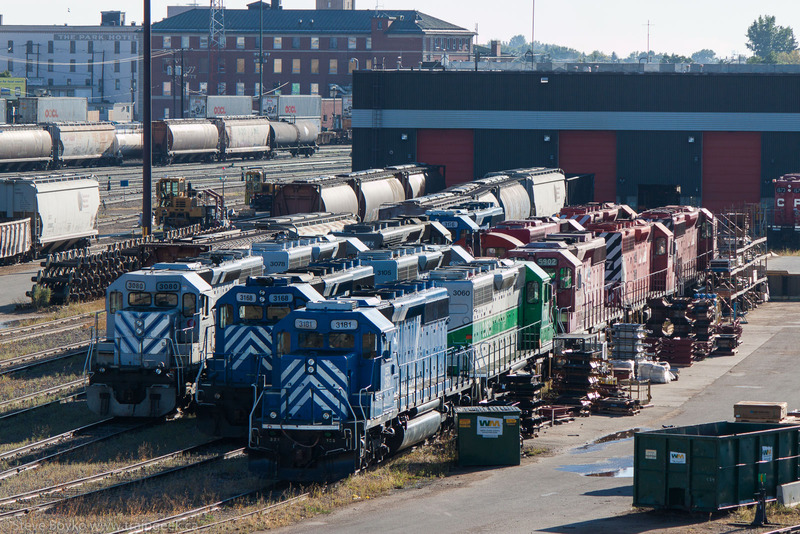 RailsNB covers New Brunswick and is very active with almost 500 members. 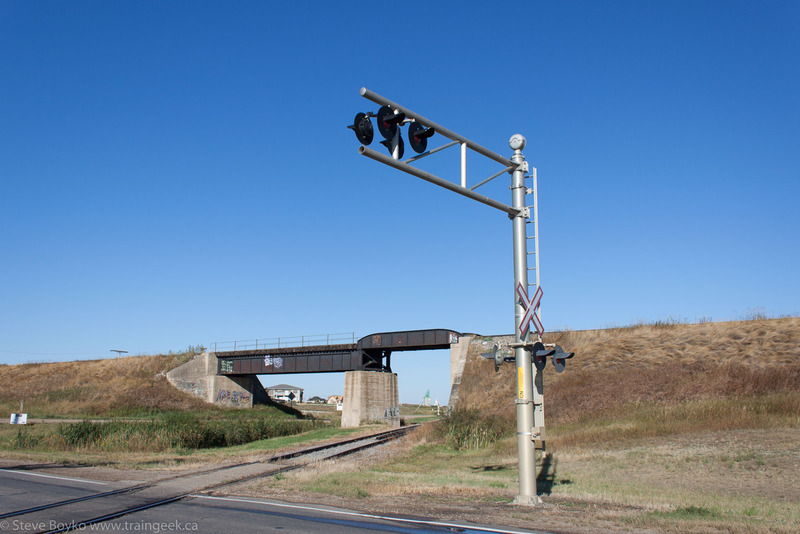 RailsMBSK covers the Manitoba-Saskatchewan scene and has become very useful to me and other Prairie railfans. 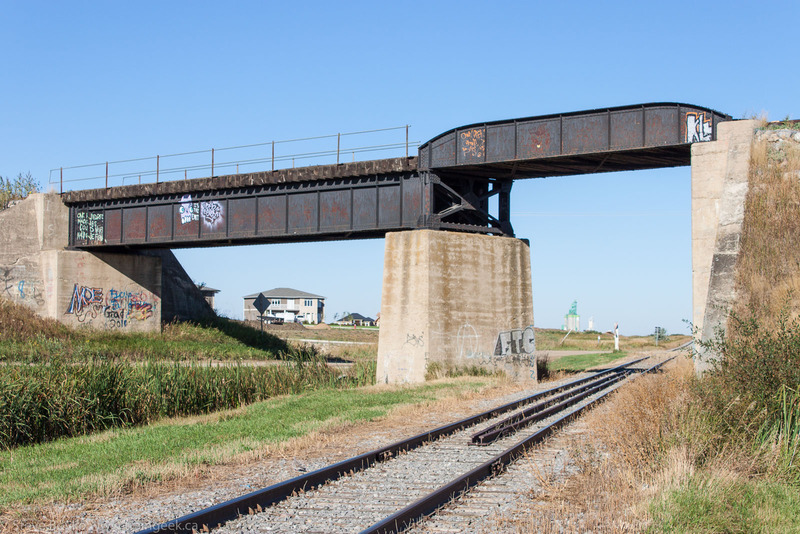 RailsAB for the Alberta scene was recently created and is growing quickly. AtlanticRails (covering the Atlantic provinces) is not quite as active but sees pretty good traffic. 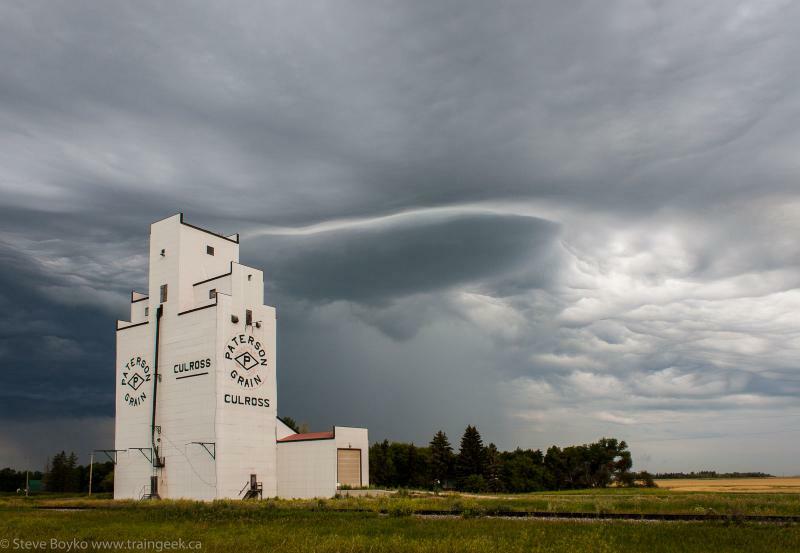 Vanishing Sentinels covers the Canadian grain elevator scene and has some great 'vator photos. The dean of Canadian elevators, Jim A Pearson, is frequently present and in fact this group was originally to support his web site. The Canadian HO Yard Sale is a great venue to buy/sell model train equipment in Canada. These are the ones I follow. There are many, many others that are on Facebook that you could follow. I tend to prefer the more focused groups over generic groups like "All Railroad Photos" but your tastes may vary. Anyone can start a Facebook group. I started RailsMBSK and cofounded RailsAB. I hope these groups (or others) prove useful to you. If you like other Facebook rail groups that I haven't listed, please comment and link to them so I and others can have a look at them! PS - I'd be remiss if I didn't plug my own Facebook site, Traingeek Images. It's up to 130 subscribers and growing. I post a photo a day and sometimes a couple. Please consider "liking" it. Thanks! 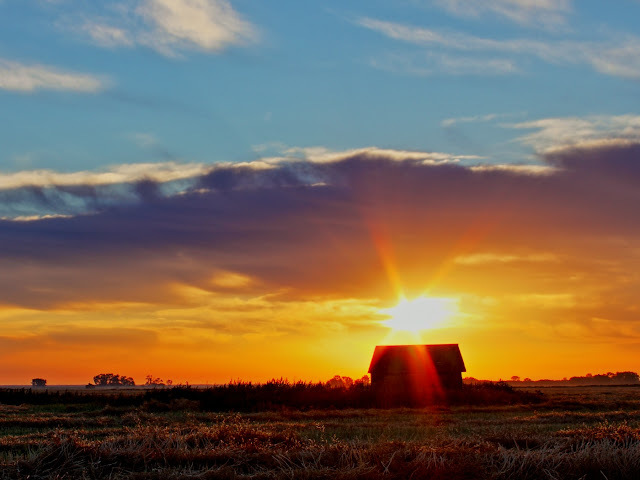 We had a little family trip to Saskatchewan back at the end of August / beginning of September, 2012. I negotiated a few hours of railfanning on the morning of September 2, so I hit the road at sunrise to get as much railfanning as I could in before my time was up. The sunrise was so awesome that I didn't even reach the end of the driveway before I started taking pictures. Anyway, I finally did get moving. We were staying in Pense, SK just west of Regina. 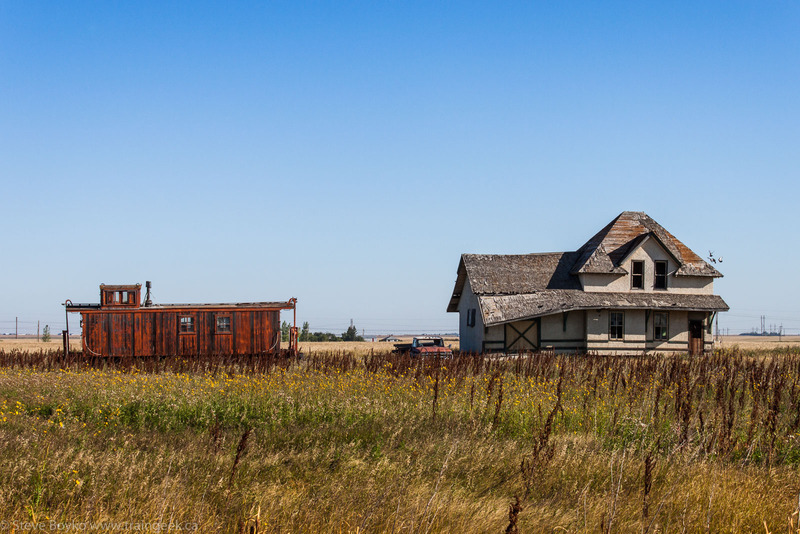 After photographing the grain elevator (again), I decided to head west to Moose Jaw and see what was up in the yard. I didn't see anything moving on the line and I started circling the yard, shooting as I went. There was the usual collection of SD40-2s, AC4400CWs, and so forth, as well as long-time resident SW1200 CP 1251. You can view all the engines I saw in Moose Jaw here. On the west side of the shop buildings, CP 1536 and CP 1554 were shunting some tank cars whilst a CP freight was sitting in the yard. There was quite a collection of locomotives parked on the west side of the shops. I believe this is where locomotives go to die... or at least wait for repair. 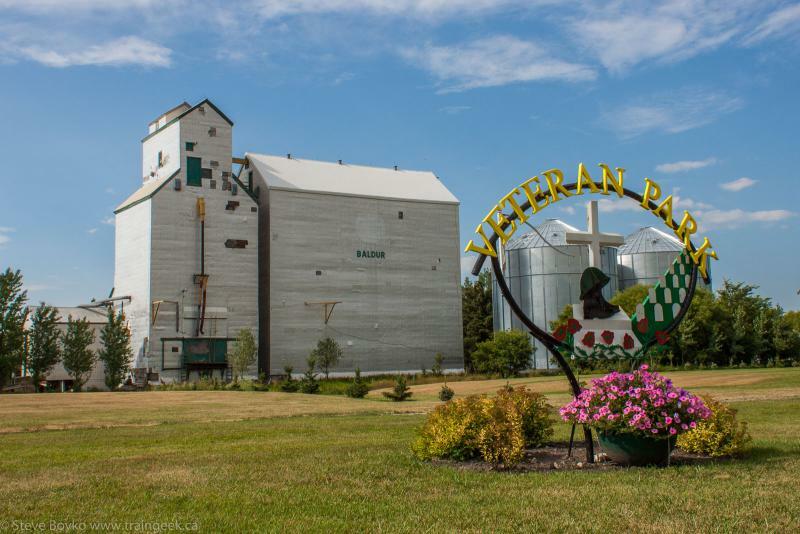 I photographed this odd Viterra elevator in Moose Jaw. I assume the giant concrete structure was built after the wooden annex but I really don't know. I left the immediate downtown area and started spiraling out, in search of elevators and anything else I hadn't photographed before. I found this Viterra concrete monstrosity west of town. 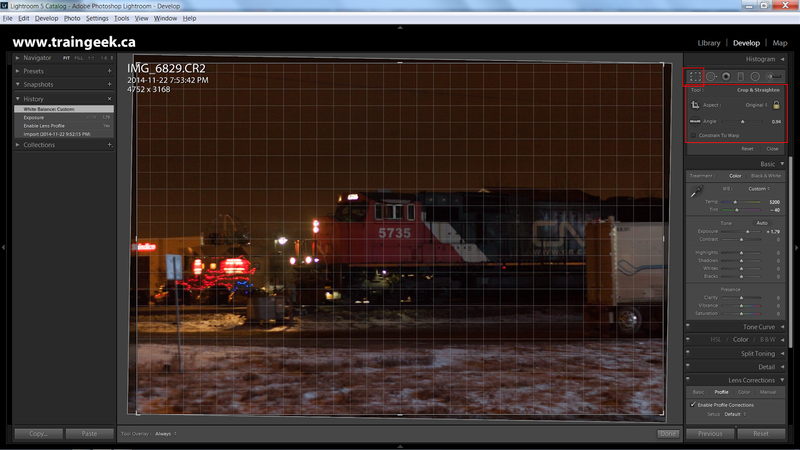 I found a place where a CP line crosses over CN. The crossing is mile 42.02 on the CN Central Butte subdivision. Note the Cargill grain elevator in the distance. That's where the CN line goes, and ends. The CP line is the CP Outlook subdivision. I started to head back to Pense after that. 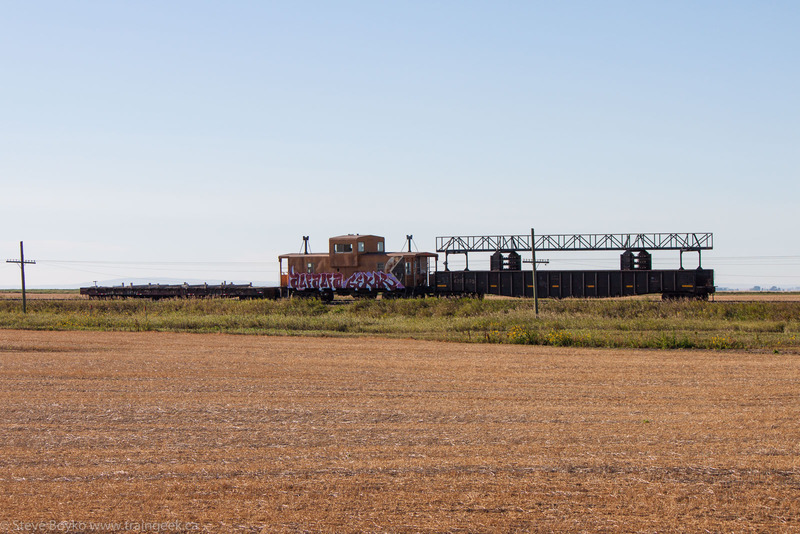 I had a bit of time and remembered that the Canadian Trackside Guide mentioned a caboose at Pasqua, so I took the time to stop there. 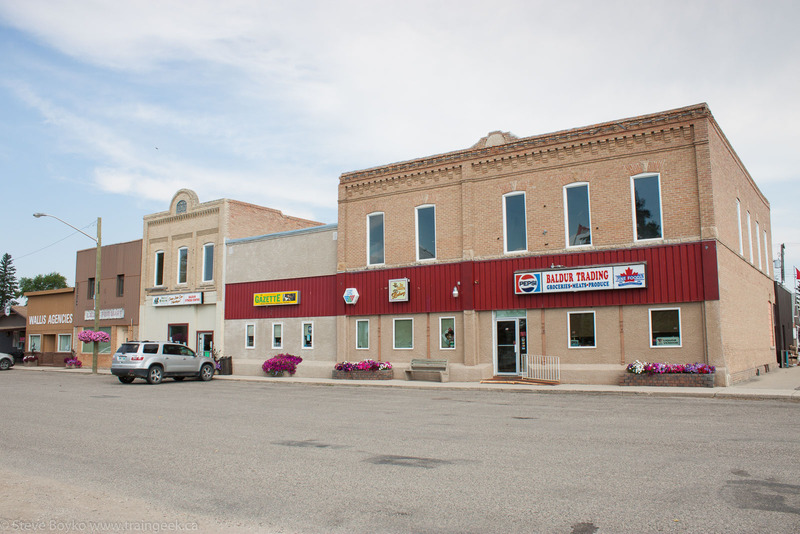 Pasqua is where the CP Weyburn subdivision diverges from the CP Indian Head subdivision and heads southeast to the US border. 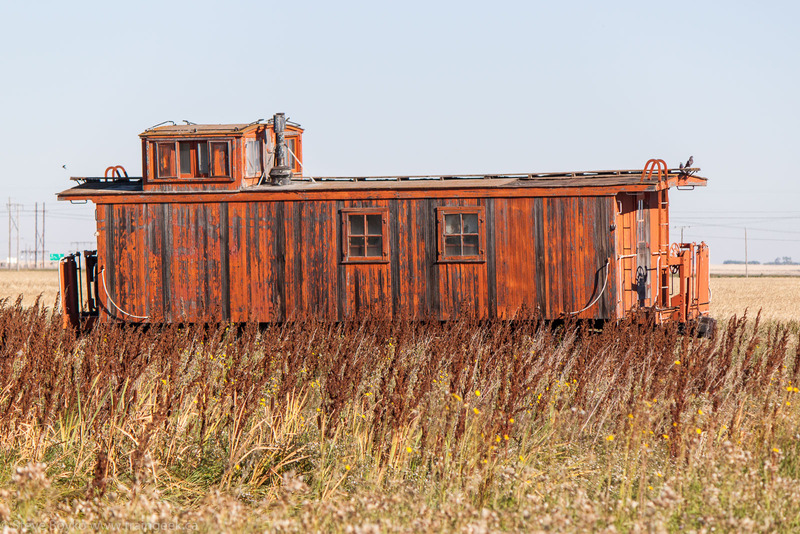 I found the caboose easily enough - together with a decrepit train station. I'd say the caboose was in better shape than the station appeared to be. 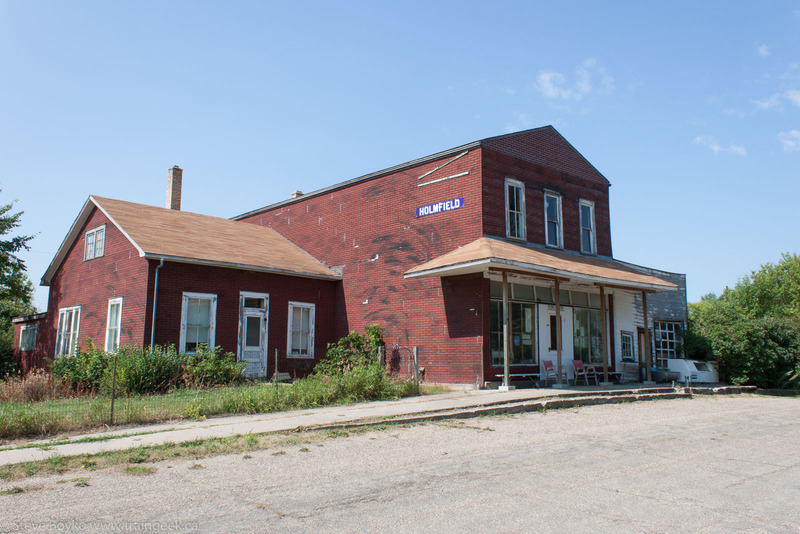 The station is not original to Pasqua but was moved there quite a few years ago. 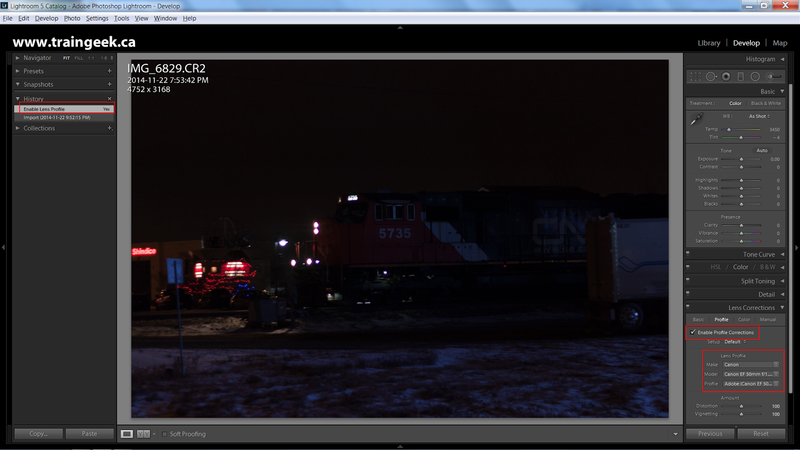 The caboose is clearly ex-CN as the "wet noodle" is visible under the cupola. 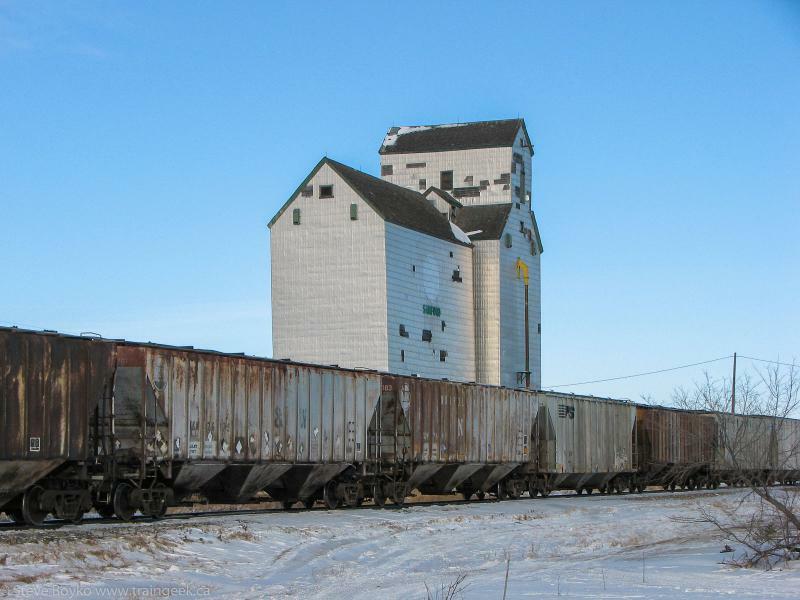 There was another caboose in Pasqua... a maintenance-of-way crummy. CP 434646 and cars were parked on the beginning of the Weyburn subdivision. 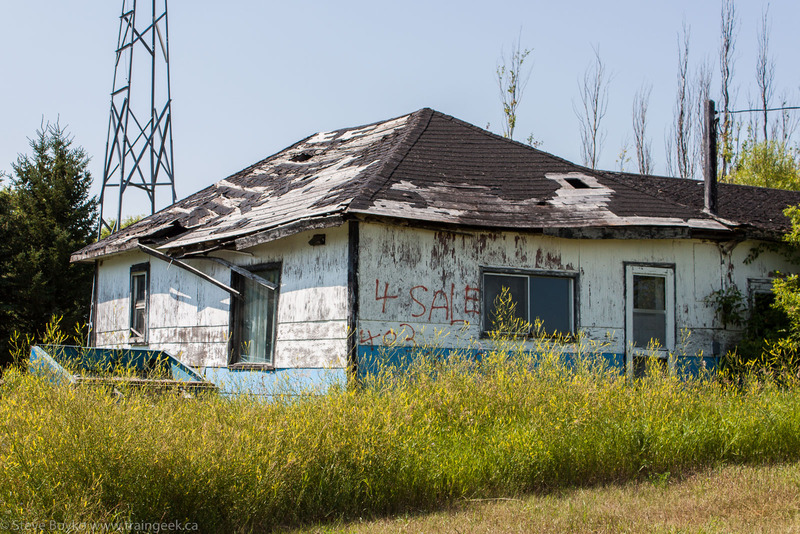 PS - Here's quite a few photos of the near ghost town of Pasqua, by Mike Stobbs. This is what I believe happened to the RS-18 locomotives owned by the New Brunswick East Coast Railway as well as its sister company, the Ottawa Central Railway. 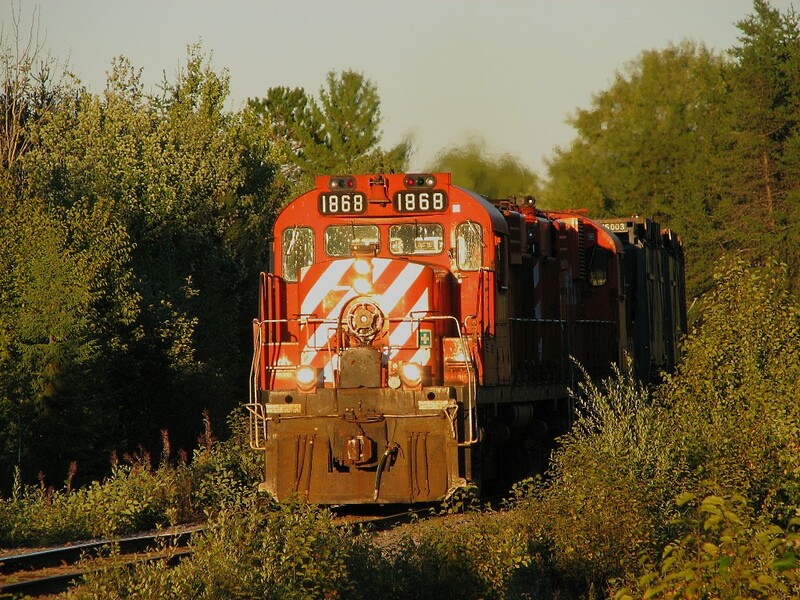 After CN purchased the Quebec Railway Corporation's assets in late 2008, the RS-18s were retired and most met the scrapper's torch. Please contact me with any updates or corrections. Thanks to those who have already written me! 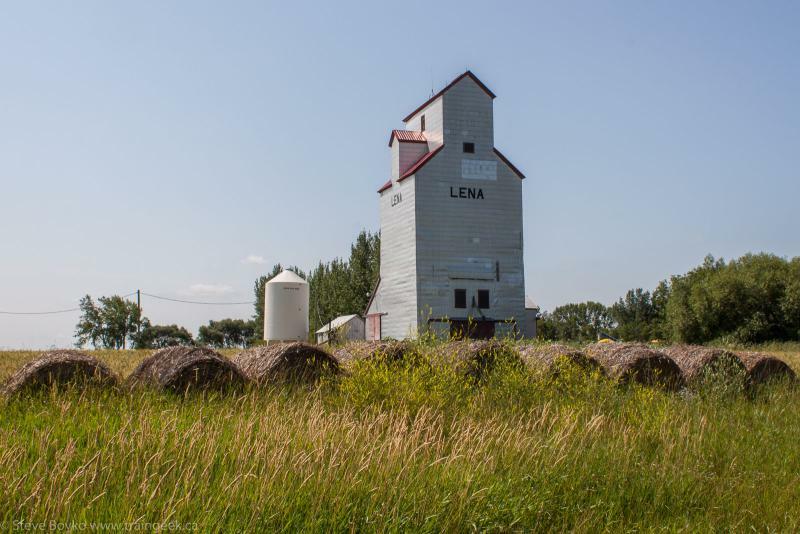 I put a call out for guest posts on my mailing list, and Glen aka "The Busman" offered up his post on the Sanford grain elevator. I appreciated that, but since it's not a new post, I decided to quote from it and offer up my own commentary and photos in addition to Glen's. Glen lives near Sanford and observed the sad state of Sanford's single grain elevator back in the spring of 2011. 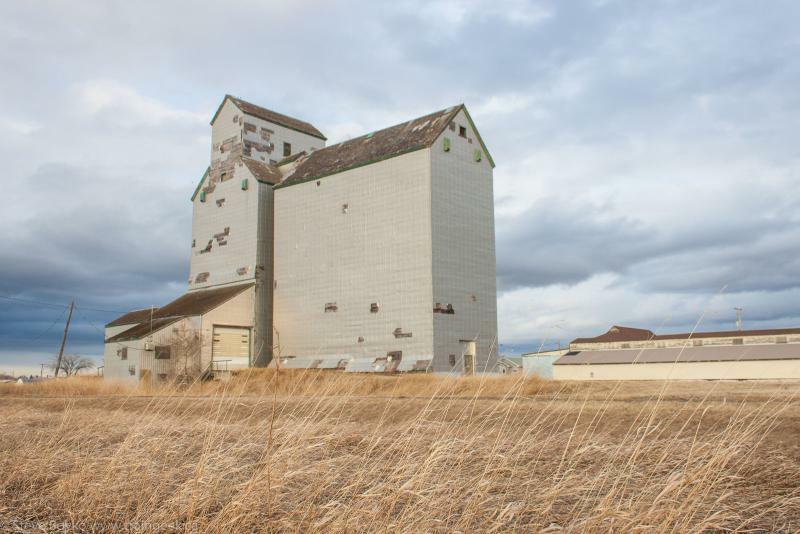 I was driving aimlessly around our town today, small little town that it is, when I looked at our lone grain elevator and saw what sad shape it is in. Did this just happen over the winter, or has it been like this for years. Like this elevator aged 30 years overnight. Yet I see it everyday! Sort of like seeing a friend that you haven't seen in ages and your first glance makes you do a double take, " Man has that guy gotten older or what.?" 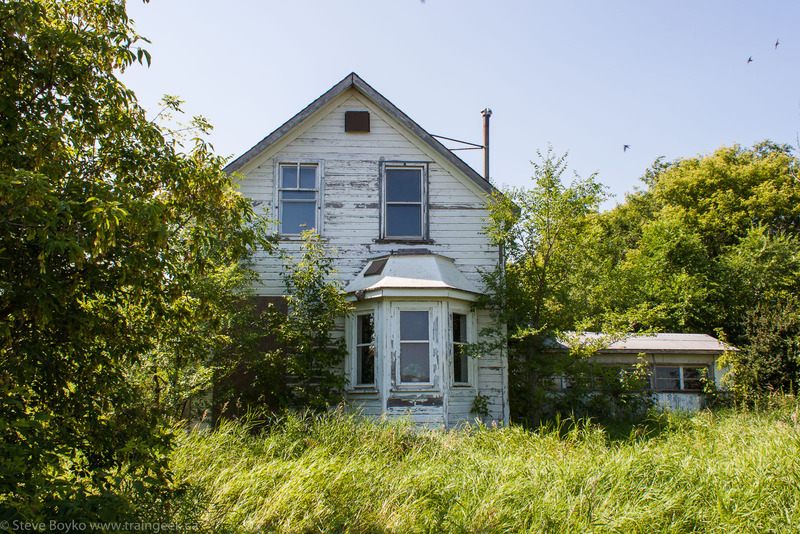 He wrote a great post on it showing the deterioration of the exterior of the elevator, plus a few glimpses of the interior as it was open to the elements. Well, I'm not one to refuse an open door invitation as it were, so a quick look over the shoulder, all's clear, and in I went. Spooky is the first thing that comes to mind. Even though it is daylight and bright sunshine outside....eery shadows and diffused sunlight combine to set the stage for a Stephen King Horror flick. Old grain lying about, spider webs hung just right, real good movie scene props in here. There are some great interior views on his blog. I found it very interesting that the elevator has two elevating legs. 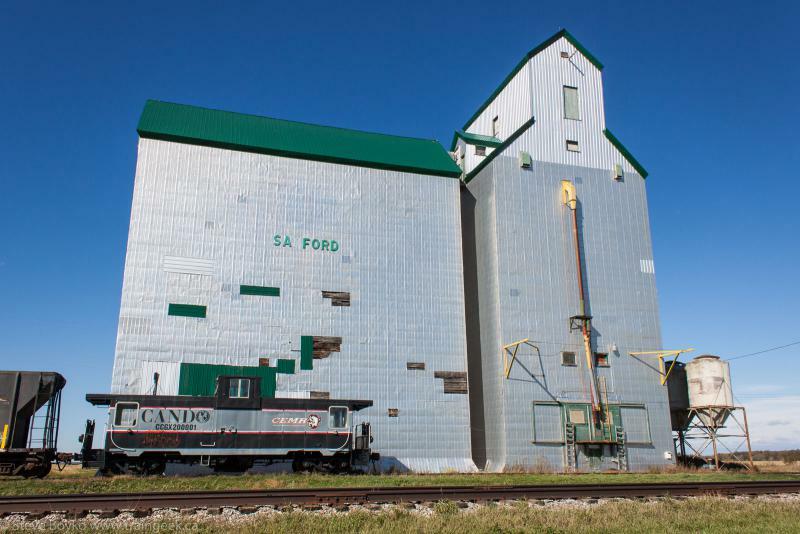 The Sanford elevator was built by the Manitoba Pool in 1948. I photographed the elevator for the first time in January 2010 when chasing a CEMR train. At the time I didn't realize there was an elevator in Sanford so I shot the train north of Sanford. After seeing the elevator in the distance, I rushed to Sanford and photographed the train by the elevator. You can see that a lot of the aluminum siding was missing at that time. Fast forward to 2014... Glen emailed me to warn me that the elevator might be torn down, so I drove out to take my photos when I could. Check out the other side, though. That's quite a large hole in the annex. Also note how much more of the siding had fallen off in the 4 years since I last photographed it. Glen contacted me later to say that the elevator was being repaired, not torn down! I was so glad to hear that. I took the kids out and we had a look at the work in progress. Glen updated his post as well to show the work. You might recall I chased a CEMR train to Sanford at the end of last month. 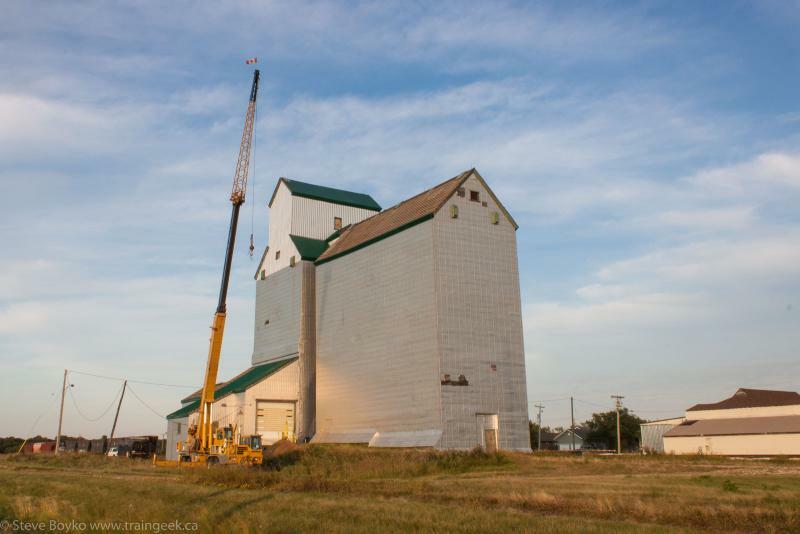 In these days of elevators being torn down (Carey came down recently, and the elevator row in Warner AB was reduced by two last week) it is gratifying to see some elevators are being maintained and repaired. I'll let Glen have the last word. Thanks for the article, Glen! Please go read his blog at flatlandersramblings.blogspot.ca - it's good! Word has it they are returning next year to complete the work and rebuild a gaping structural hole on the east side and then re skin as well. 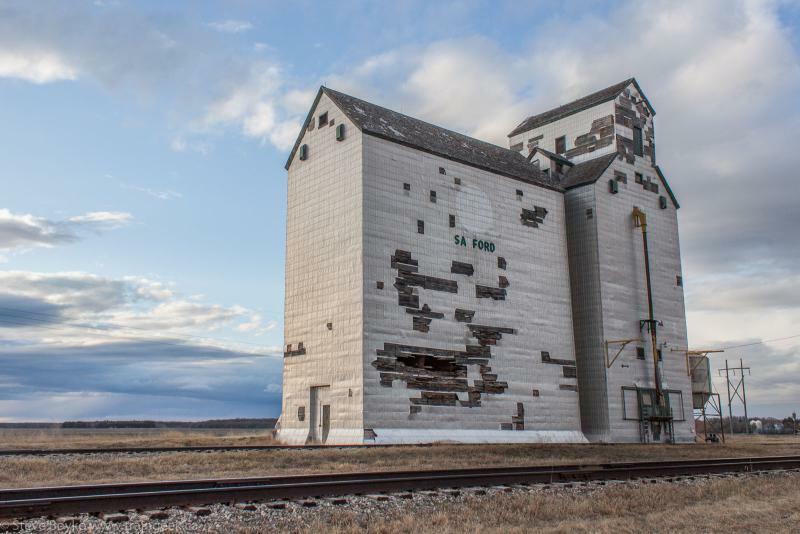 Someone suggested they should turn this elevator into a museum and community space, similar to what they did to the elevator in the town of Plum Coulee in southern Manitoba. Either way, I'm glad the elevator will continue to stand guard over our little town for years to come.